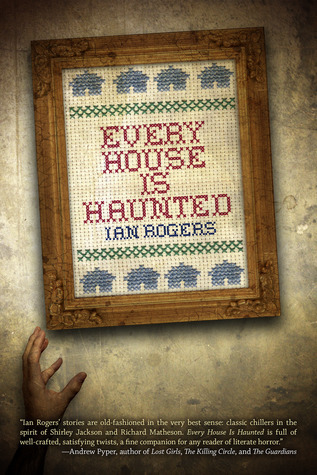 Many of the 22 short stories in Every House is Haunted, the debut collection by Ian Rogers, feel connected. As the title suggests, this is a book about hauntings, though the stories Rogers tells venture beyond the well-worn template of the haunted house tale. On top of this unifying theme, several stories also feature paranormal investigators, something like agents Mulder and Scully of the X-Files, or hint at a shadowy group overseeing such intrusions. Rogers seeks to establish a common world in which paranormal events and entities are controlled, studied and policed by a broad and shadowy organization devoted to these functions. Rogers starts off strong with "Aces," on its surface a routine family drama in which Toby's sister has trouble in school and exhibits weird behavior, like many adolescents. This seeming normalcy masks the extreme strangeness of what's really going on with the sister, who is obsessed with finding "aces," playing cards which she discovers in strange places, such has hovering in mid-air. Toby only comes to understand his sister's unusual nature when paranormal investigators arrive and explain. Another strange and surreal piece early in the book, "A Night at the Library With the Gods" again displays Rogers' skill for creating a familiar, mostly normal world, then gradually increasing the strangeness until the reader recognizes they're in something more akin to nightmare. In "The Dark and the Young," linguist Wendy takes a mysterious job, translating an occult "black book." Some of the rituals described in this bizarre text make Wendy and some of her coworkers hesitant to participate. A few less mature stories are sprinkled throughout, and in my opinion Rogers could have made a stronger debut impression by omitting these. I understand the desire to include early work, and indeed this flaw is so common in first collections I'm hesitant to mention it. At any rate, the few less-compelling pieces are more than offset by a high overall quality. The more recent stories seem generally darker, more macabre or surreal.Rogers closes the collection with a powerful series of tales, deftly and confidently told. In "The Inheritor," Daniel Ramis unexpectedly inherits a house from his father, with whom he had a terrible relationship. He visits the childhood home, a place evoking the terrible memory of his sister's early death. Daniel always thought his father had sold the house when he moved, and can't understand why he'd held onto it. Along with the house, Daniel is also left contents of safe deposit box: a gun, and a note from his father hinting at explanation. All that remains is for Daniel to discover what responsibility comprises the most horrible aspect of his father's legacy. A husband in "The Candle" gives his wife a guilt trip about possibly forgetting to blow out a candle before coming to bed. Time passes, and feeling guilty, he goes downstairs and finds something weird and disquieting in the dark. Here's another story that starts off realistic, then takes a weird disconnect, making a subtle and eerie observation of the ways we open gaps in relationships through small acts of selfishness or distrust. The last tale, "The Secret Door" makes a powerful ending to the book. Sarah and husband move into an old country house, and find a secret door bricked up on back side. She sleeps, and wakes again to find her husband's not there. Other details, such as the bed and their car, inexplicably have changed. The story veers more deeply into surrealism. Sarah envisions a boy yelling from the bottom of a well, telling her she's the one who put him there, hinting at connection to her earlier decision never to have kids. Her experience swerves between alternating realities, now alone and sick, then with her husband telling her she's not well. It depicts increasing detachment from reality, a creepy back-and-forth between the real and the surreal. Every House is Haunted is an above-average short fiction collection, especially noteworthy as a debut. The writing is both transparent enough for mainstream readers, and artful enough for those who like their prose with an edge. At his best, Rogers is very compelling, and the growth demonstrated within these pages suggest he's one to watch.